Crossing back and forth over the border between poetry and prose this book brings fresh perspective to the big questions of human life. The Niagara River that courses through the border region of Western New York and Canada inspired the book and is its central metaphor. Giannetti engages the reader in observations of the natural world and philosophical ponderings about the flow of our everyday lives, the preoccupations of our contemporary culture and the possibility of living an authentic life. Robert M. Giannetti lives in Lewiston, NY, on the banks of the Niagara River, where he formerly owned an antiquarian bookshop. He holds a B.A. from Niagara University and a Ph.D. in Renaissance English literature from Duquesne University. One time college teacher and participant in several business ventures around the country, he now devotes himself exclusively to his writing and collaborative work with artists and musicians. Along with his many solo poetry readings he also performs in concert in the duo, Voice and Viola, he founded with classical violist, Leslie Bahler. Publications include: The Frontier: Poetry and Prose (2017) and two prior books of poetry, Drawn by the Creek (2003) and Winter Vision (2011), the latter of which was translated into Polish and published in Warsaw in a bilingual edition that was awarded the Best Book of Poetry prize at the 34th International November of Poetry festival in Poznan, Poland in 2011. 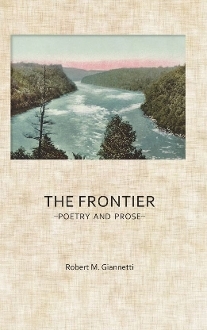 In 2014 Giannetti was honored by the University at Buffalo’s Poetry Collection with the publication of a limited edition chapbook of his poems in celebration of National Poetry Month. For more information please visit www.RobertMGiannetti.com.